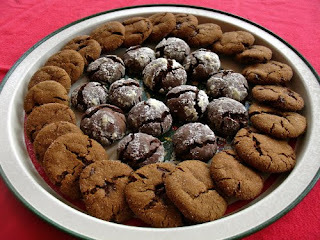 Mystery Lovers' Kitchen: Crinkle Cookies! It's Crinkle Cookie Day! How I wish there were more time before Christmas. I would love to keep baking cookies and having more winners. My heartfelt thanks to each of you who entered the Christmas Cookie Contest. I've had a wonderful time, and I hope you've enjoyed it, too. When I began, I didn't have any particular selection parameters. As the recipes rolled in, I realized that I started to look for variety in flavors. The most submitted cookie recipe by far was rolled or sliced sugar cookies. Decorated, undecorated, in colors, in logs, or to be cut out. With lemon extract, vanilla extract, almond extract. I have to say, they all sounded wonderful and some of the photographs were absolute show stoppers! This suggests to me that sugar cookies are what we usually think of when we think of Christmas cookies. For a while there, I was tempted to bake all the sugar cookie recipes! I realized, though, that we needed to cover all tastes, and found myself looking for more variety. 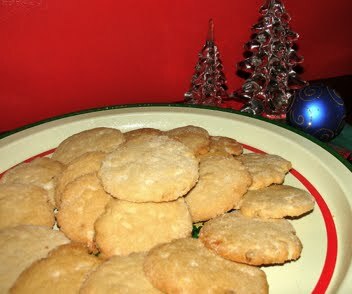 The second most popular cookie recipe was a wedding cookie type of recipe. They're obviously Christmas favorites! Surprisingly, I received only three bar cookie recipes, and two of those were almost identical! What are the odds of that? No brownies, no lemon squares, no linzer cookies, no spritz cookies, no gingerbread cookies! I'm not quite sure what that means. This contest has turned out to be terrific for me personally. Baking one batch (or two today!) of cookies a week isn't an overwhelming proposition. We still have over a week to go before Christmas, and I already have a fabulous selection of delicious cookies ready to be served! I would love to do this again next year. Maybe we can work it into some sort of challenge so that some of you will end up with a lot of terrific of cookies, too. I'm not quite sure how to work it yet, but I love the idea of a cookie a week. 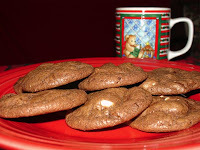 I sent out my winter newsletter this week and included links to the winning cookie recipes. One of my friends who will be coming for a visit emailed me right away to ask if there would be any left when she arrives! LOL! I'm also tempted to ask Berkley to let me do another Christmas book featuring *your* recipes! Wouldn't that be fun? On to this week's winners. Originally, I thought we would have five winners. I was so intrigued by both of these recipes that I made them both anyway so we have six winners! Curiously, they're made in almost exactly the same manner but the flavors are totally different. 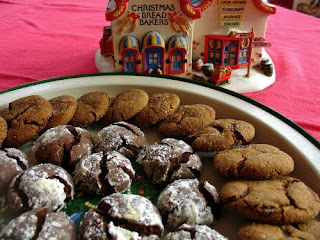 Our first winner today is Elisa Varey for her Mocha Crinkles! Elisa grew up in Alexandria, near Old Town, where my protagonist, Sophie Winston lives. She was just there and says it's all decorated for Christmas! Beat brown sugar & oil in medium bowl with electric mixer. Mix in sour cream, egg, and vanilla. Set aside. Mix flour, cocoa, espresso, baking soda, salt and pepper in another medium bowl. Add flour mixture to brown sugar mixture and mix well. Refrigerate dough until firm to 3 to 4 hours. Preheat oven to 350 degrees. Place powdered sugar in shallow bowl. Set aside. Cut dough into 1 inch pieces. Roll into balls in powdered sugar. Bake on ungreased cookie sheets for 10-12 mins or until firm to touch. When you walk into really great cafe, the aroma of coffee envelops you, and there's that undercurrent smell of freshly baked cookies. That's how these cookies smell when they're baking. The dough mixed up very nicely. This is another easy Nina Reid Norwood recipe that anyone can tackle. One of the things I like about both of these recipes is that they have to be refrigerated. I made both in the evening and baked them in the morning. That means you can whip up the dough, stash it in the fridge and bake them later at your convenience. They're rolled in powdered sugar and baked on an ungreased baking sheet. Very easy. And then they come out of the oven all crinkled and smelling heavenly of coffee! Our second winner this week is Laura Kramarsky for her Very Ginger Chocolate-Chip Cookies! I was intrigued by the combination of ginger with chocolate, and fascinated by the fact that the recipe uses crystallized ginger instead of powdered ginger. This is one of my favorites: very ginger chocolate-chip cookies. In a food processor or blender, cut ginger into 1/3 cup sugar until ginger is finely ground. Pour from container and set aside. Put butter and 1/3 cup sugar in mixer and beat until fluffy. 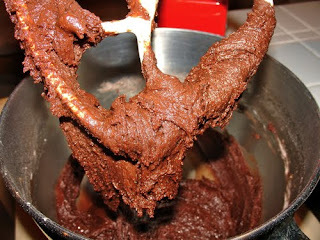 Add ginger mixture, molasses (or cane syrup), and egg, continue beating to mix. Mix flour, soda, cinnamon, and nutmeg in a separate bowl. Add to butter mixture; beat to blend well. Shape dough into 1-inch balls and coat in remaining sugar. Place balls 2 to 3 inches apart in lined or non-stick baking sheets. Bake in a 350° oven until slightly darker brown, 11 to 14 minutes total (if using 1 oven, switch pan positions after about 6 minutes). Transfer cookies to racks to cool. Serve, or store airtight up to 1 week; freeze to store longer. If you love gingersnaps and chocolate, you'll adore these cookies! Grinding the ginger made all the difference. The flavor is evenly spread through the cookies. The hardest part of this recipe was grinding the ginger. I started with the small bowl of my food processor. It broke the ginger down, but only into tiny balls. I had more luck with a mini food processor, but be prepared to let it run a bit. Except for that, this recipe falls into the anyone can do it, Nina Reid Norwood category. 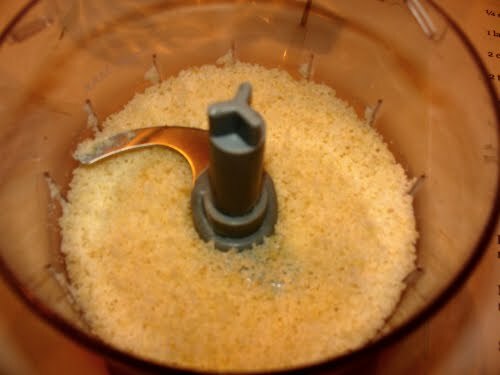 I do think you need some kind of electric food processor or a very good blender to grind the ginger so that it's fine. Once again, this recipe called for rolling the dough into balls and then rolling them in sugar. Both recipes would be fabulous choices for little kids who want to help bake. The dough was nicely manageable and it's fun to roll it in sugar. And the result is two very similar cookies that don't look alike or taste alike! The cookies in the middle are Mocha Crinkles and the cookies around the edge are Very Ginger Chocolate-Chip Cookies. Congratulations to Elisa and Laura! And now, can you believe it -- I have to bake three kinds of cookies that are favorites in my family! 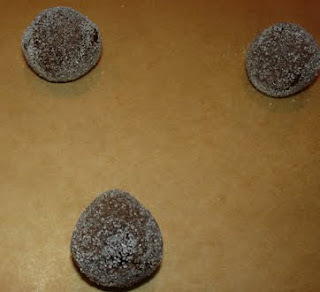 We are snowed in tonight and tomorrow until the plows come through so we will be making the mocha crinkles!! I just checked my pantry and I have everything we need :-) Thanks for taking the time to make all these lovely cookies the past few weeks...I have added them all to my Christmas cookie book (OK, it is an old spiral bound book but I call it my Christmas cookie book!)!! The only disappointment is that your book was due from Amazon tomorrow...I do hope the plow guy is early!! It's too cold to go out anywhere today. Hubby has requested cookies... I have all these recipes and the family faves. Will be busy making the house warm and smelling good. Thanks for the contest, and yes, maybe a cookbook would be in order! Congrats to Elisa and Laura on winning Krista's Christmas Cookie Contest. Both recipes look and sound fabulous. 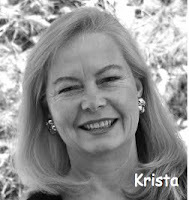 Krista -I can't wait to try them both! Baking is such a wonderful way to enjoy the holiday season. This contest was so much fun. Thank you for sharing your oven with all of us! 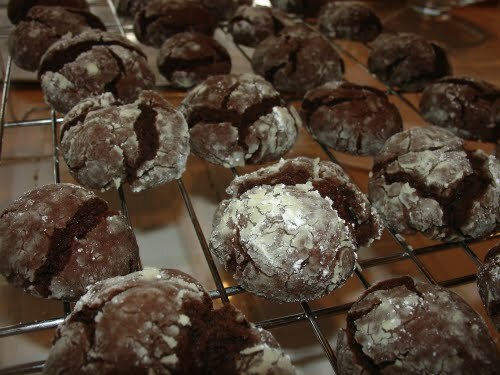 I think I'm going to add the Mocha Crinkles to my "To Try" list this year. I'm putting the kiddos to work helping make cookies next week. :) Thanks for all of the great recipes! I baked gingersnap cookies yesterday (my gluten-free recipe) and the house smells incredible. I can only imagine how your house has smelled these past few weeks! Yum. So...what are the three family favorites you have to cook? Share, share! I absolutely cannot wait to start baking cookies. My manuscript deadline (Wednesday) has kept me out of the kitchen so far this season, but I'm itching to get in and try some of these. Thanks, Krista, this is so much fun. And I definitely think this is a wonderful idea to bring back next year. Nanc, I had to get these cookies into the freezer pronto. I left a few out for noshing on last night and they were delicious. I hope you enjoy them. And I hope the plow makes it through. Wouldn't that be wonderful? A snowy day with a warm kitchen, cookies, and a new mystery! Elizabeth, you'll have to share what happens at the cookie exchange. Sounds like fun! Cleo, it was my pleasure. Next year we need to get all the MLKers involved. I had such fun! 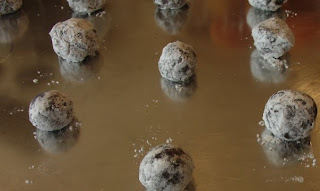 Janel, the kids will love rolling the Mocha Crinkles into powdery balls. It's a perfect job for little hands. Avery, for those of German heritage, it's not Christmas without lebkuchen! 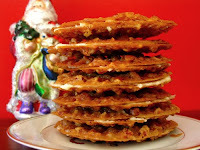 We also love Florentines, and, yes, I will be making traditional cut-out sugar cookies, too! Julie, next year we're going to get you involved! I'm so glad I did this. 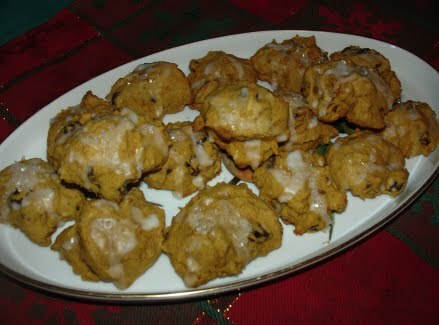 I am happy to hear you loved the mocha crinkle cookies. A family friend passed this down to me a long time ago, and they are a hit with my family. add these ginger cookies to our annual baking. What a great pair of recipes! Can't wait to try them. I have a feeling they will be added to our Christmas 'must bake' list. 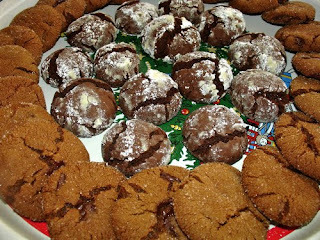 Elisa, we love your Mocha Crinkles! Jenn, I think you'll like the ginger cookies a lot. They're excellent! Mary Jane, my "must bake" list got a lot longer this year! Hmmm, thought I posted on this last night! I am so glad you enjoyed the ginger cookies. You can make them without chocolate chips for those (crazy people) who prefer their cookies without chocolate or for those who are (horrors!) allergic! 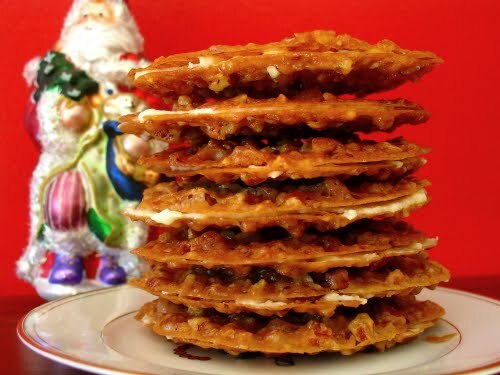 I am definitely going to try making those Crinkles! Congratulations on your winning recipe, Laura! We certainly enjoyed them here -- with the chocolate chips! Thanks for the recipes! I'm looking to make those very ginger chocolate chip ones today. Yeah! They look, lovely. Good job, Krista!